Osteoarthritis is a degenerative disease characterized by the breakdown of cartilage in the joints. Without their cushion of cartilage the bones rub against each other causing pain, inflammation and loss of movement. People often link this disease with aging, putting it down to general "wear-and-tear" but, although we do not know exactly what causes the disease, it does not seem to be a fatality of old age, or caused by aging, although most people suffer from this disease to some extent as they age. People with old sport or work-related joint injuries seem to be more prone to the disease. Obesity definitely raises the odds of suffering from this disease, as a higher body mass index puts more stress on the joints. The wearing of high-heeled shoes tends to also be a trigger, because too much stress is put on the knees and feet. Heredity also appears to play a big part in the development of Osteoarthritis, particularly in the hands and hips. This has been born out by various research projects, some of which suggest that genetic abnormalities in the structure of cartilage and collagen genes can trigger the disease. There is also evidence that there is a gene that makes females more susceptible to this type of arthritis and also causes bony lumps on the end of finger joints. Not every person who suffers from the disease has symptoms. When present, these range from mild to extremely severe, affecting weight bearing joints such as knees, feet and hips and the back, as well as the hands. Besides pain in the affected joints, patients experience stiffness and loss of mobility, which can eventually lead to trouble walking. Inflammation in the joints is often present. The pain is often worse in humid weather and patients experience more problems during the night due to inactivity. Any long periods of inactivity lead to stiffness. Patients are usually less bothered by the disease in warm, dry climates and are helped by keeping active, getting enough exercise and doing stretching classes. The pain usually decreases with time. A diagnosis is made based on a physical exam as well as an analysis of the symptoms. An x ray can confirm the diagnosis in people over 60, when the disease has progressed enough to show up on the x-ray. Any abnormalities, such as bony projections or erosions, or cysts in the joints will also show up. If there is any uncertainty, blood tests can rule out other forms of arthritis. 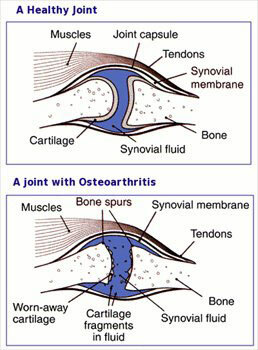 It is possible to distinguish osteoarthritis from other joint diseases because its progression is specific. It usually occurs in older people and is located in only one or a few joins, there is less inflammation than in other arthritic conditions and the pain progresses gradually. 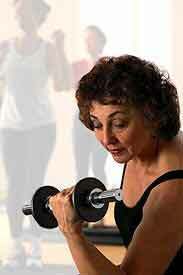 Weight control prevents extra stress on weight-bearing joints, thereby decreasing the risk for developing the disease. 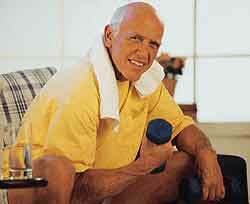 Exercise maintains joint flexibility and improves muscle strength. By strengthening the supporting muscles, tendons, and ligaments, regular weight-bearing exercise helps protect joints, even possibly stimulating growth of the cartilage. Estrogens may promote healthy joints in women according to Recent Studies that suggest that hormone replacement therapy may significantly reduce the risk for postmenopausal women developing osteoarthritis, particularly in the knee. To protect themselves older people are advised to take the recommended dose of vitamin D as well as calcium daily. 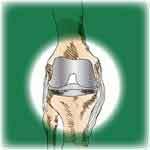 This will protect their bones and keep their joints healthy. Fish or Seafood Cartilage can also be helpful. Glucosamine and chondroitin sulfate are also popular nutritional supplements that may protect against the disease. In fact, the latest arthritis research has shown that Glucosamine has proved to be very effective and has no side effects, is completely safe, and eases the pain while it helps to combat the disease. If osteoarthritis has already developed, the above vitamins and supplements can diminish the symptoms of osteoarthritis, reducing pain, stiffness and swelling. A person with the disease should consult with a doctor before using dietary supplements to treat it. 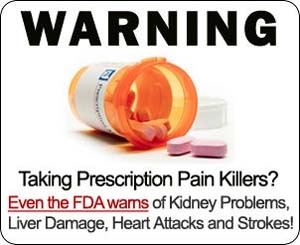 The medical practitioner may prefer to prescribe one of the various pain control medications, including anti-inflammatory drugs and painkillers such as aspirin, paracetamol, and ibuprofen. For inflamed joints that are not responsive to medication, infiltration of glucocorticoids may be helpful. Patients should avoid putting stress and strain on painful joints. As people live longer, there will inevitably be an increased need for joint replacements and other treatments for this painful disease. At the moment there is a wealth of new cutting edge treatments becoming available as years of research into treatments bear fruit. Age-well.org will try and keep you up to date with these new developments as they arise. We will also be making available an e-book about osteoarthritis and the different things you can do to relieve the symptoms as well as in-depth information on the new technology available. Drop me a line at agewell@bluewin.ch if you want to know when this ebook becomes available. In the meantime here are a few links which will bring you up-to-date with the information available at present. Fellow webmaster, Hank's site is a comprehensive guide to joint pain. Sciatica is often related to arthritic change. Learn all about sciatica from arthritis from a real patient.